When I was young my family lived in a brick farmhouse built in the 1800s. Of all the rooms in that house, I have more memories that take place in the kitchen than in any other room. I would stand at our Hoosier cabinet and sift flour for my mom when she baked. I’d curl up on the floor next to the avocado-colored oven and listen to the local library’s dial-a-story while twisting the curled phone cord between my fingers. I helped my mom give my baby brother baths in the kitchen sink. I eagerly tasted flour for the first time while sitting on the edge of our kitchen table while mom made cookies, even though she warned me I wouldn’t like it. The clarity of those memories must be part of the reason that when I come home from work after a difficult day, or if I’m feeling stressed about anything, I grab some bowls, raid the cabinets, crank the oven and find a certain peace in the kitchen. After months of transition at work, an impending office relocation, a full week of losing valuable planning and productivity to having to pack boxes instead, I came home from work last night and spent the entire evening in the kitchen. Challah bread, with its density and sweetness, is always my first choice of bread to make and share. It’s what I bring to parties, to holidays and to work. My recipe always changes, but it always seems just right. Last night I made it with olive oil instead of canola, and molasses instead of honey. I used more flour than normal and let it rise nearly all evening. It baked up deeply colored and perfectly puffed. I think challah is my favorite bread not only for the taste, but also because the braid in the bread serves as a sort of outline for pulling it apart while it’s still warm. For me it’s definitely a bread to be pulled apart, not sliced. While the yeast proofed and the challah dough rose, I busied myself with a sweet treat for Regan and me. 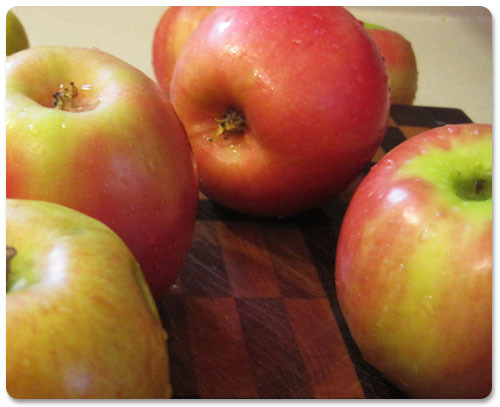 I decided that the over abundance of apples that arrived in our food delivery bin should become an apple pie. Using my go-to pie crust, I tried a new recipe for the filling and was quite pleased. 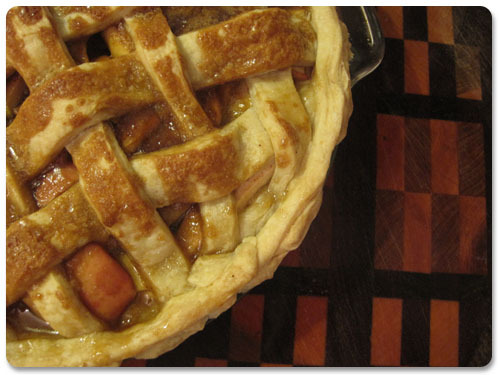 A liquid sugar mixture, heated on the stove top to the point near caramelizing, is slowly poured over the lattice-work crust and over the plain apple slices resting underneath. 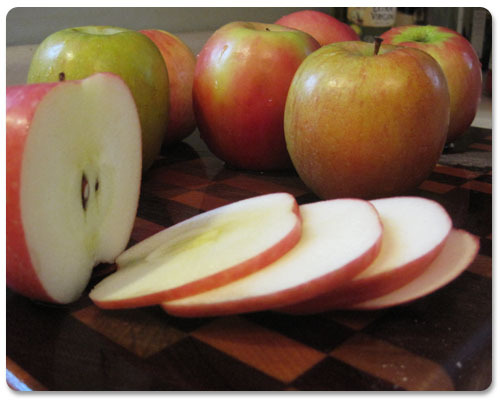 As everything bakes, the thinly sliced and layered apples slowly absorb the sugars and become tender and sweet. The crust where the liquid is poured over gently crisps while it bakes. By the end of the night our small house was warm and cozy with heat from the oven. The thought of another day at work didn’t weigh me down at all. And we had baked goods to share and to enjoy on our own. As we sat on the couch with a piece of pie each, Regan and I had to convince the other that just one slice was plenty. 1. In a food processor mix flour, butter and salt until well incorporated. The mixture should be very fine crumbles. 3. Wrap in plastic wrap and chill in the refrigerator for 10 minutes or until ready to use. 1. Mix the yeast with the warm water in a large bowl. Let sit for 5 to 10 minutes until a creamy foam appears on top. 2. Add oil and molasses (or honey) to the yeast mixture. Mix with a wooden spoon. Add eggs. Mix again. 3. Then add 4 cups of flour and the salt. Mix together with spoon until sticky dough forms. Slowly stir in another cup of flour. After 5 cups of flour have been added you may need to mix in the rest of the flour with your hands. As you add the rest of the flour be sure not to over knead the bread. You don’t want to knead it too much or it can become tough. You want to knead it until smooth and satiny. 5. After the dough has risen, gently deflate, then split the dough in half. Divide each half into three equal pieces. Gently stretch each piece into a long rope, approximately 15 inches long. 6. Once all the dough is stretched, use the first three ropes to braid the first loaf and the remaining ropes to braid the second loaf. Place each loaf on a metal baking sheet, ungreased. The easiest way to braid the loaf is by making an X out of two of the ropes, then placing the third rope vertically, bisecting the X. Braid one half, then rotate the pan and braid the other half. 7. 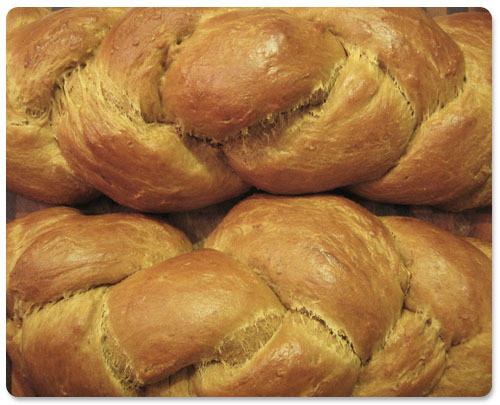 Cover each braided loaf with a towel and let rise at least another hour. 8. Make an egg wash out of an egg white and 1 tablespoon of water. Whisk together and wipe lightly over the top of each loaf with a pastry brush. Make sure to not drip too much of the egg wash down the side of the loaf or else it will burn on the pan. 9. Place both loaves in a preheated oven at 350 degrees Fahrenheit for 30 to 40 minutes, until top is lightly browned. YUM! I remember the first time I saw you / your mom make challah bread. I think it was an Easter holiday when I went home with you. I thought it was amazing that people actually made bread from scratch and it looked so easy (not to mention so light and yummy). I’ll have to try that apple pie too, darn, should had made that for the Naturalization party tonight! Apple pie would have been a fun choice for a Naturalization party, but I like the sound of your red, white and blue trifle as well! Can’t wait to hear how it went over. Good call on the recipe, Mauria! It’s up on this post now. I hope you have fun making it. Let me know how it goes 🙂 It’s my favorite food of all time.